Antsy Pants™ Come In Even Larger Sizes For Bigger Kids! If your big kid (over 45lbs) still needs overnight protection or daytime diapers, you can create your own Antsy Pants™ Large Package tailored to your family's needs. Check here for sizing information. You will also receive a printed How-To Guide. These very special larger Antsy Pants™ are $26.99/ea. A separate night insert will be needed for overnight use. This order form can be extremely slow to load, but if you can give it a few minutes it will eventually populate! note: Some colors of each size are available in stock. If you are looking for a specific color and can't find it above, you can most likely special order it by emailing us at, but keep in mind that special orders typically take around 3 weeks to ship. *A note on night inserts: If you will be using your Antsy Pants™ Large Pull-Up Cloth Diapers exclusively at night, remember to purchase one or more inserts for each diaper. How do you know which inserts and how many you will need? Bigger kids can sometimes generate much larger volumes of pee at night than toddlers. For a child who is only wetting up to 6 or 8oz overnight, one of our hemp/organic cotton inserts inside the pocket should be plenty of absorbancy. If, however, your child wets between 8oz and 16oz, we have found that wrapping one hemp/cotton night insert inside of another works amazingly. 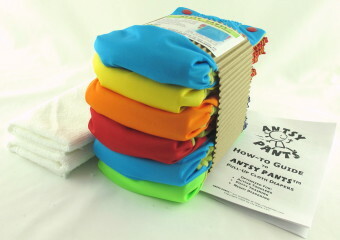 To place an order for Antsy Pants™ Pull-Up Cloth Diapers, fill the form and click the "Add To Cart" button to add items to the shopping cart. Get help determining how many Antsy Pants you will need with thestash calculator. What are Antsy Pants™ made of? The main diaper shell is polyurethane laminate (PUL) backing a soft polyester knit fabric. The absorbent pocket layers are made from cotton/polyester sherpa. The lining is a performance wicking material that forces moisture through the fabric into the absorbent layers, and the side panels are cotton broadcloth. We use Lastin at the leg openings; all other elastics contain natural rubber. Shell face 100% polyester, back 100% polyurethane. Absorbent layers 80% cotton / 20% polyester. Sides 65% polyester / 35% cotton. Select the size and gender desired from the dropdown menus and click the "Add To Cart" button above. You will be taken to a shopping cart to confirm details of your purchase. If you need more than one size or color of Antsy Pants™ Pull-Up Cloth Diapers, you can return to this order page via the "Continue Shopping" button in the cart. Follow the instructions to complete your purchase with your preferred payment option; Discover, Visa, MasterCard, American Express or PayPal and add the required information. Wait for confirmation that your order has been completed. You will be returned to GetAntsy.com automatically. Check your email for an email confirming your purchase and another containing a link to your bonus ebook. You will be able to download the electronic file immediately; no need to wait for your package to arrive. We are presently shipping to the U.S., Canada and all countries served by PayPal. We are happy to research shipping charges and import requirements to make sure we can get your Antsy Pants™ to you before you place your international order. Our email address can be found here. More information on international shipping is available on our FAQs page.